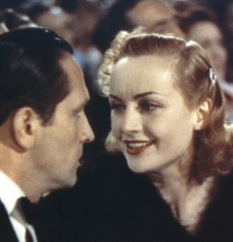 Now I'm a fan of Carole Lombard. She's very funny. 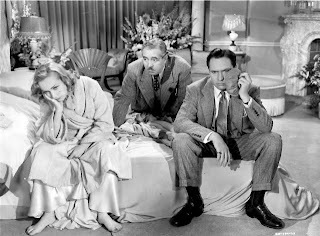 All the information that came along with this movie described it as a "screwball comedy," and it very much is, despite the fact that when we first meet Carole Lombard's character, Hazel Flagg, we think she is dying of radium poisoning. Frederic March plays Wally Cook, a somewhat disgraced newspaper man who goes off to to redeem himself by finding the next big story... the story turns out to be bringing the ailing Hazel to New York City to show her the time of her life before she dies. New York loves Hazel...too bad she's not really sick. The Vermont scenes were a lot of fun. The townspeople do not appreciate a city newspaper man invading their space. He gets a lot of nasty looks, including a nasty look from the actress who played the Wicked Witch of the West in The Wizard of Oz. At one point, while Wally is walking down the street trying to find Hazel, a little boy runs out of his yard, bites Wally on the leg, and runs away again. Biting townspeople? Just as much hilarity occurs in New York... of course Hazel and Wally fall for each other, and this leads Hazel to feel really guilty about pretending to be dying. So guilty she even tries to fake a suicide so she can remove herself from the situation. The only part of the "screwball comedy" I wasn't so fond of was the punching that went on between Wally and Hazel when Wally found out about the hoax. Don't punch people! Or spank people! "Give me your word of honor you won't try that again, or I'll spank your little..."
Two stars, but I would definitely see this again. Really, it was a very entertaining movie.